Jim and Debbie Mills homeschool their 7 children in San Diego, California. They are NATHHAN's CA state coordinators and have generously shared their time with many homeschooling families. They are support group leaders of Special Children -Special Blessings, special education consultants, and are available for presentations, counsel and encouragement. For the last several years, I have been developing I.E.P. 's (Individual Education Programs) for my challenged teenage son, as well as for my other five children including the baby! For many children with disabilities the traditional scope and sequence does not apply. When there are no text books to work through, the I.E.P. becomes the curriculum. By giving every day activities an academic \ life skill equivalent and "framing" it into an I.E.P. we can do "school work" every day and not even open a book, if necessary. On those days when I feel like we didn't get anything done, I can look at our I.E.P. goals and objectives and realize that important learning did indeed take place. It is easy to put together an I.E.P. It is simply a way of organizing information about your child and putting it into your everyday life. STEP ONE - Pray for direction. STEP TWO - List priorities. Go on a working date with your spouse and ask yourselves "What are the most important areas for our child to grow in? What areas will he\she have the most success? STEP THREE - Set domains. Determine how you will organize this information. Group each area of goals into "domains". You might divide a sheet of 8 1/2 by 11 paper in quarters and assign a heading to each of the four sections or "domains". 1. academic 2. self-help 3. Domestic 4. Spiritual\Character development etc. Domains are limited only by your imaginations. Try to limit it to 4 - 6 so that it doesn't get confusing. STEP FOUR - Set long range goals. Now that you have decided upon priorities for your child, you can set some goals. When setting goals keep in mind these four things. 1. Is it appropriate for my child? 2. Is it attainable in a reasonable length of time? 3. Is it measurable, by observation or demonstration? 4. How will it be accomplished? In one years time, Trevor will be able to: put his socks on independently and put his shoes on the right \ left foot properly. Currently, Trevor cannot accomplish these tasks, so that becomes his base line that we will be comparing against next year. It is a measurable task because I can easily evaluate it by his demonstration. In selecting appropriate goals I will usually refer to several resources: A regular education scope and sequence will give academic information regarding your child's chronological age, as well as developmental age. A special education functional skills inventory will give you other ideas. Long range goal: In one years time, Trevor will scrape and rinse the dirty dinner dishes and load \unload the dish washer without prompting, staying on task until the job is done. Short term objective: Trevor will empty \load the dishwasher as per daily chore schedule under parent supervision. As the parent\instructors we are able to assist Trevor daily with his "chores". We can also evaluate (measure) his progress by watching him (demonstration). Periodically, I will indicate with a slash (\) on his I.E.P. that the task was introduced. The slash (\) becomes an (X) when the task is completed. I also note the assessment date. Most of our I.E.P. goals are implemented by our family schedule. Domestic skills become "chores", academics are "school work" or "tutor time", communication skills become "phone privileges". Spiritual goals are accomplished by family devotion time, AWANA and going to church. Community goals can become family camp outs, shopping with Mom and so on. Remember to keep it simple. Resist the urge to attempt a lot of new skills. It is better in the long run to be consistent in the small things. Fit your plan comfortably into your family's way of life. As the year progresses, you have the freedom to "flex" the schedule and possibly adjust the I.E.P goals if needed. As parents, we are not required to know everything about all disabilities. You know your child best. You can become an expert in the field of his or her special needs. 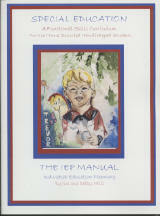 Click here to order Debbie Mills' IEP manual!